The humble, hardworking cowboy of the 1800s would undoubtedly be surprised to learn that his everyday work boots are now fashion statements. Everything about the original cowboy boot was based on function, not fashion. The pointy tip was designed to make it easier for the cowpokes to insert their boots into stirrups. While flat-front boots required perfect aim, the pointy tip helped ease the boot into the stirrup without requiring much precision. The heel wasn’t designed to make diminutive cowboys feel taller; its purpose was to make it easier to rest the boot on the stirrup for hours at a time. When the cowboy was working with livestock off the horse, the heel served as a kind of brake he could dig into the ground, to prevent ornery cows from pulling him around by his rope. Similarly, the high shaft of the boot protected the cowboy’s legs from brambles, barbed wired, snakes and blunt-force trauma. First, make sure you have a clear idea of why you’re buying cowboy boots. Is it to wear at the rodeo once a year, for a country-and-western dance class, or are you considering taking up riding horses as a hobby? Riding boots need to come up higher to protect the legs as they bounce against the horse and various leather accoutrements. Since sizing can be tricky, it’s helpful to find a knowledgeable salesperson to help you. A little slippage in the heel is normal and will diminish over time. It should require a little effort to get your foot into the boot. You should feel firm contact with insole and arch support. Your toes should have a little wiggle room but not much. If your foot just slides right it in, the boot is probably too large. Make sure you wear a sock of the same style and thickness that you would normally wear. Cowboy boots vary in width from the narrow AAA to the extra-wide EEE. Again, it’s helpful to have an expert check to see that you have enough room in the boot along the sides. Another sizing tip is to squeeze the leather on the front of the boot at the turning point between the foot and the ankle. You should be able to hold a small amount of leather between your fingertips; if you can’t grab any leather, then the boot is probably too tight. If you opt for the classic pointy-style boot, of course, the shoe will look a little long since your toes can’t squeeze themselves all the way up into the pointy part. Round-toed boots are also available, and they may be more suitable for people with wide feet. First-time boot shoppers may be overwhelmed by the sheer number of brands available. Most experts agree that the top brands in terms of style and value are Lucchese, Tony Lama, Ariat, Anderson Bean, Dan Post, and Nocona. While most traditional boots are made from cow leather, there are now boots available in everything from lizard skin to ostrich skin. These skins offer a unique look and feel, but no material can beat cow leather when it comes to long-term comfort and durability. The exotic materials tend to be prone to drying out and cracking. If you're in the market for alligator boots, keep in mind that you'll need to do considerably more maintenance to keep them in tip-top condition. Cow leather also requires upkeep, but it can withstand periods of neglect without any permanent damage. As with any shoe, make sure you walk around the store for a while to assess how comfortable the boots are when you’re in motion. While the fit will change slightly over time, an extended break-in period should not be required. Though most people buy boots for the iconic Texas look, you might be surprised by how comfortable they are—if they’re made right. 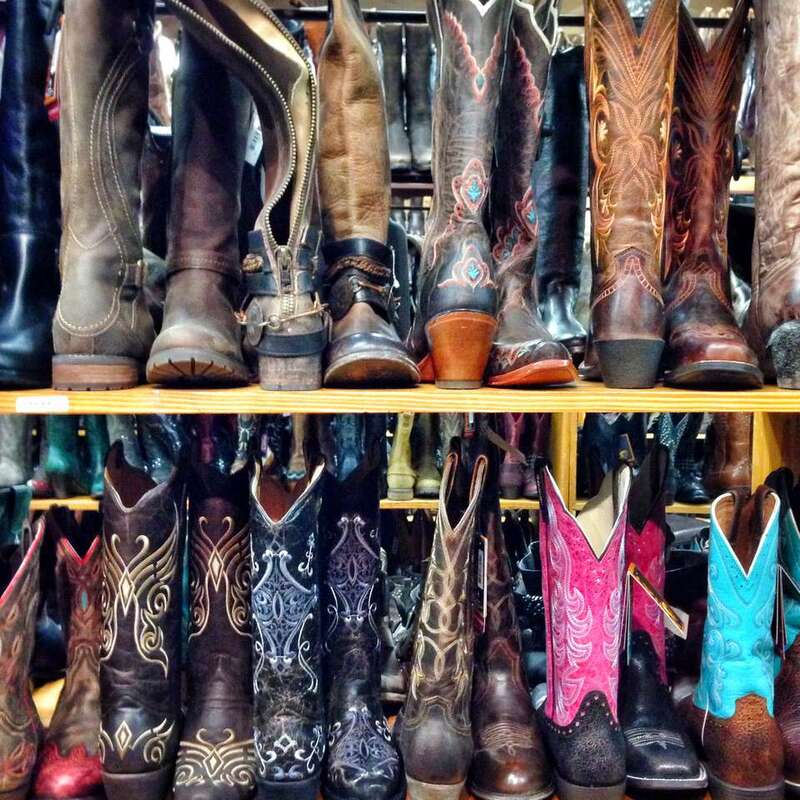 Here are some of Austin’s best boot purveyors. It’s hard to miss the giant boot-shaped sign on South Congress Avenue that marks the entry to Allens Boots. The store offers a huge selection—a warehouse-sized showroom with multi-level, 8-foot-tall shelves. Unlike most shoe stores these days, Allens Boots always has plenty of staff on hand to answer questions and help you pick the right boots for your tastes. Since 1977, ranchers and hipsters alike have flocked here to buy both practical and ornately decorated boots. The store also sells cowboy hats and belts. If you’re in the market for even fancier boots, just walk a few blocks down Congress Avenue to find Heritage Boot. Business has boomed after a positive story in Forbes magazine in 2011. The store doesn’t sell online because the proprietors believe that the right fit can be only be determined in person. Some people may be put off by the “don’t touch” signs, but the proprietor simply wants to keep the boots in mint condition for the ultimate owner. The handmade boots offer exquisite detailing and surprising comfort. Many styles feature whimsical and retro designs from the 1930s to the 1960s. Want a boot featuring a desert landscape complete with a saguaro cactus? This is the store for you. If you’re looking for used boots on a budget, head to Brazos Trading Co. But call ahead (512-796-5312) because Charlie’s hours are somewhat irregular. The store also sells used bikes, leather jackets and miscellaneous vintage clothing. In business for over 30 years, Charlie isn’t interested in newfangled stuff like social media or having a website, but he provides excellent in-store service when he’s available. If you can’t find boots to suit your tastes at the other shops, why not order a custom-made pair? This humble shop in south Austin caters to rock stars and ranch hands and everyone in between. The craftsmen who work here can bring an old pair of boots back to life with new heels and insoles. And they can often make repairs on a surprisingly tight schedule. For sheer expertise, there’s no one in Austin that can match the skill level of the talented staff at Texas Custom Boots. They also make leather gun belts, wallets, belts and bracelets. Vintage boots are available too. Sure, it’s a chain store, but Cavender’s offers an excellent boot selection, and the prices are a little more budget-friendly than at the hipper stores around Austin. If you’re planning to head to the rodeo or a Western-themed event, Cavenders is the best place to get decked out head to toe in Western wear. The store features a huge variety of belts, pearl-snap shirts, skirts, vests and cowboy hats. Judging by hipsters spotted on the streets, Western shirts with pearl snaps seem to now be appropriate attire for everything from a rock concert to a night at the theater. A vintage store with everything from boots to furniture to vinyl records, Room Service always has some shiny new/old things to catch your eye. The prices are reasonable, and you may find yourself walking out with a lamp, dining table or antique glassware. Unlike many vintage stores, you don’t have to wade through a bunch of junk to find the good stuff. It’s all good stuff! A sense of fun and whimsy permeates the items on sale at the shop. The staff intentionally keeps the inventory limited to the finds they’re currently most excited about. So if you spot something you like, buy it—because it won’t be around for long. One of the best boot stores in north Austin, Tiny’s Western Shop offers a small, carefully selected inventory of new boots. In addition, the store sells cowboy hats, custom hat bands, shirts, blue jeans, wallets, jackets and belts. Tiny’s also has Western wear for children, so this is the ideal spot to buy a complete cowboy or cowgirl outfit for your little ones. Offering enthusiastic service plus margaritas and beer, Texas Boot Company makes boot buying fun. The staff is eager to answer questions and help out first-time boot buyers. There’s also a separate party room with a pretend cow on wheels, and the owner sometimes shows off his roping skills. The designs range from classic to completely off-the-wall, and the price ranges are similarly varied. In addition to boots, the store sells jewelry, purses, jackets, cowboy hats and kids’ clothes. The selection at Austin Boot Barn is huge and includes boots made from unusual materials, such as caiman, python, alligator and ostrich skin. If your tastes are a bit more conventional, there’s also plenty cow leather boots, along with cowboy hats, jackets, vests, belts and skirts. The store also has one of the largest offerings of kids’ cowboy hats in town. Housed in a beautiful historic building in south Austin, Texas National Outfitters focuses exclusively on boots made by humans, not machines. Most of the boots are actually made right there in the store. For other leather goods such as belts and custom guitar cases, the shop acquires items made by dozens of craftspeople around Austin and Houston. You may pay a little more here, but your boots will probably last a lifetime. Vintage stores can always be hit-or-miss when you’re searching for a specific item, but you are very likely to have success here in your hunt for stylish and affordable cowboy boots. There are often several boot styles for men and women, ranging from traditional to downright eccentric. The store also has tons of other fun stuff such as a rack of baseball jerseys, concert t-shirts, vintage jean jackets, funky jumpsuits, sequined blazers and biker jackets. Keep in mind that this store’s concept of “vintage” is the 1980s and ’90s. If you’re determined to go as MC Hammer next Halloween, this should be your first stop. Despite the large variety of items, this isn’t one of those packed-to-the-gills vintage stores. Everything is well organized and easy to find.